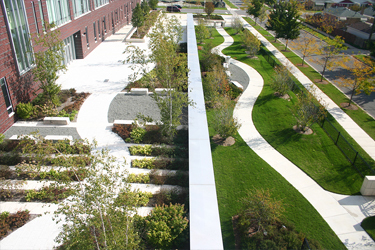 Since 1976, JRA has provided professional landscape architectural consulting services including landscape architecture, urban design and site planning along with associated areas of specialization. Throughout our 37-year history we have consulted to architects, engineers and planners, municipalities and institutions, developers and individual owners. The experience and diverse backgrounds of JRA's partners and staff bring together unique talents from across the country. Our national experience with a wide range of plant materials, climatic conditions, regional horticulture and local contracting has afforded us a wealth of practical knowledge and know-how. This allows JRA to design and manage our projects effectively and economically in many regions of the country. Of course, it is our Midwest experience that is the foundation of our practice. JRA continues to be committed to the creation of beautiful, high quality and functional design solutions. Our conscientious approach, respect for our work and the materials with which we work ensures successful, high profile, long lasting results. We are proud many of our projects are, after 37 years, still thriving and providing joy to users and casual observers alike.